What a month! Miss G had her 1st birthday party last week, so I’ve spent the past month planning the menu, then the week before the party getting the food ready, so please forgive me for the lack of posting on here! We’ve also been attending some of Miss G’s friends parties as well, so it’s been hectic!! I’ll be posting some of my fave foods from Miss Gs party on here over the next few weeks, but I thought I’d share with you a quick little treat that makes a great gift or party lolly! CTO and I attended Ms SL’s and Mr B’s kitchen tea the day after Miss G’s birthday party, and I wanted to give them a little present. I had found a really cool 70s-esque Max Brenner chocolate tin and I wanted to fill it. 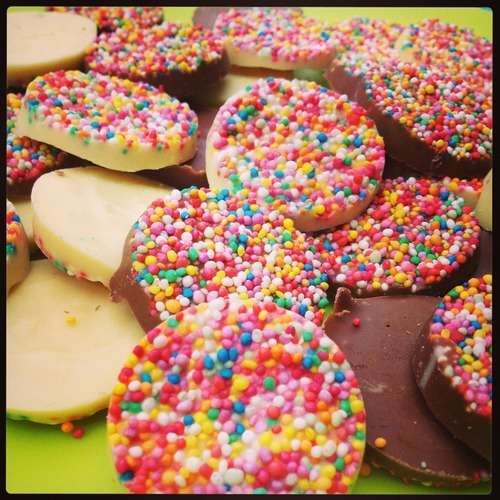 CTO had the idea to make homemade chocolate freckles instead of just filling it with random store-bought lollies, so I ran down the street to get extra chocolate and sprinkles and gave it a go! Chocolate Freckles were an integral chocolate of my youth. When my brother and I were kids, our mum used to give us $1-2 each to spend on sweets if we’d behaved ourselves whilst she’d done her errands. Wise woman that she was, she steered us over to the $1 bags of lollies at Kmart rather than the basic Freddo’s and Mars Bars. And the bags in the mid-90’s were a minimum of 100g! Giant sized for an 8 year old! My brother tended to get the biggest bag, and I always grabbed something chocolate, normally the freckle/chocolate buddy mix. The main problem with commercial freckles in my opinion is that there is never enough chocolate in them! The sprinkle to chocolate ratio is 1:1, and most of them are hard enough to crack your teeth because the sprinkles are little more than rocks. I wanted mine to be nice and thick, with a decent layer of sprinkles coating one side. I tried a few different ways of getting the sprinkles to stick, and after getting very frustrated then having a lightbulb moment, I think that this is the best way; using a mini silicon muffin tin. It gives you a nice round shape, the chocolate doesn’t run all over the tray, and by putting the sprinkles underneath the chocolate in the base of each mini muffin hole, the chocolate has a greater chance of sticking to the sprinkles than if you had just scattered it over it. You’ll need 2 x 12 cup mini muffin tins for this recipe, or if you’re like me and only have the one, just do it in 2 batches. This is a great little recipe to make with your kids after school or whilst they’re on holidays. The littler ones can help measure the sprinkles into the bottom of the muffin tins, and the older ones can drizzle the chocolate on top. And they’ll all have fun popping the chocolate buttons out of the pans and watching the silicon spring back into shape. In the bottom of each mini muffin cup, place ½ tsp of sprinkles. Shake trays to even them out. Break chocolate into pieces and place into a microwave safe bowl/jug and microwave for 1.5 min on high, stirring with a dessertspoon every 30 seconds. 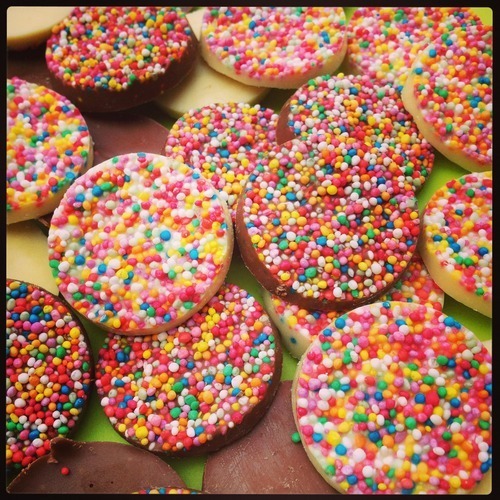 Drizzle an even amount of chocolate over the sprinkles in each mould, then smooth it out with the tip of the spoon. Leave chocolate to set at room temperature, or place in fridge to speed it up. Once the freckles are set, tip the muffin tins upside down over a mixing bowl or deep dish to catch the extra loose sprinkles. Pop the silicon cups in all the way to release the freckles. Notes: You can make these in any silicon mould you like, try regular silicon muffin tins for larger freckles or even novelty ice cube moulds for funny shapes to suit a party theme!